Creative Arts Leadership @ Its Best! The book sets out the methodology and links take the reader to related worksheets and other resources. Global Citizens Art has the advantage of a targeted, participating global audience while remaining local and relevant. The conceptual framework for the creative arts educational strategy embraces technology and the digital arts while encouraging local co-creation of community based design. 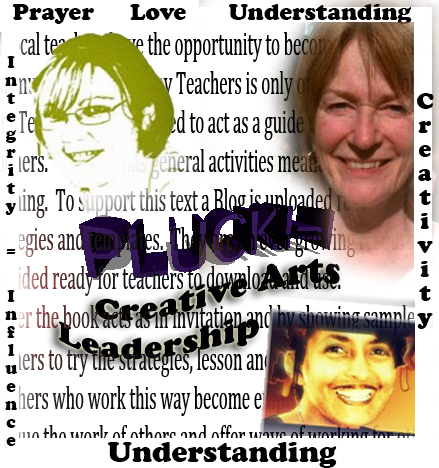 The mission of the educational community is to acknowledge that Creative Arts Leadership can be plucky. The first volume of a workbook bundle series has been created with the input of local Catholic School Teachers and Creative Educators and Artists. It is encouraging to think that this talent exists in our local teaching environment. The work of creating an educational community of learning inquiry and studio practice synched to the National Curriculum is being addressed as a pressing need. To do this we are following the American lead of on the community portal Teachers Pay Teachers. Education week movie acknowledged that the value of the arts as an educational tool has been watered down since the 1970s. This was a proactive time, when Freire and Boal made their classic call for student centred teaching. The value and the potential of the arts has been obscured over the years even though the need to kindle resilience, empathy and compassion is even greater. Social and emotional learning (empathy, compassion understanding tolerance and resilience) Gesture Drawing Worksheet Education for Compassion & Understanding. Synergy and integration between History Science Math and English to enhance learning. Highly motivational community environments for teachers. Many of the processes originate from personal authentic narrative. The work engages, students in an approach to language that is accessible to all learners. The book Global Citizens Creative Arts Text (link) features the work of a sprinkling of local Catholic teachers who have allowed their work to be used as exemplars so that writers can pioneer this inclusive approach to educational community. Rachael Jacobs. Lecturer Creative Arts ACU. All local teachers/ artists / creative arts therapists and ESL practitioners have the opportunity to become involved in a broader community. Teachers Pay Teachers is only one of the many strategies to empower and enthuse an inclusive community approach. The text has been designed to act as a guide to involvement in a community of teachers. There are general activities meant to share a way of thinking about teaching. They can be accessed from a Blog, which is uploaded regularly with lessons, tips, strategies and templates. This synergized approach represents an ever-growing resource of lesson ideas provided ready for teachers to download and use. How To Draw a Feather is one example. The book acts as in invitation and by showing samples and guides provides exemplars for teachers to try, strategies, lesson and ideas and about which to provide feedback. Teachers who work this way become empowered as they try out new strategies, critique the work of others and offer ways of working for other teachers to critique. Soon blended learning courses will be offered that “power start” the strategies. These are intensive introductions to methodology, and strategies with regards technology and social media for the classroom. They run as an introduction and then after an 8week period they have a follow up session. Subscribe at the website if you would like to become involved. From time to time the book is placed on special free offer as a way of introducing the concept to teachers and asking for feedback. In particular we are asking for teacher questions and guidance with regard the style and design of resources and design of the online communities. It will become available for free download review and feedback soon. In the meantime this lesson will give you a feel for How It Works. Deirdre Russell-Bowie (2009) Syntegration or Disintegration.Models of Integrating the Arts Across the Primary Curriculum, International Journal of Education & the Arts. Vol 10. No 29.
Who Are the Authors and Artists. This entry was posted in artists, authors, leadership and tagged AU national curricuum, creative arts leadership, creativity, digital arts, educare, fiona foley, helen clarke, honey, influence, integrity, knowledge, love, online community for teachers, open market for educators, philosophy of education, plucki=i, prayer, rachael jacobs, steph unger, understanding on June 4, 2013 by Jo Murphy.